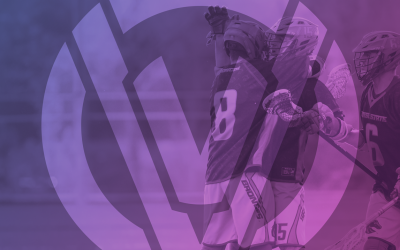 A few months ago on Twitter, there was a conversation centered around naming your “top 5” MCLA players of all-time. It was fun to see a bunch of names thrown around that I hadn’t seen in a while. It got me thinking, who are the best players in MCLA history? There are strong arguments for a number of players. Ted Ferrin from BYU holds the record for most points in a career, Mark Plonkey from CSU was a dominant force for years at LSM. Brekan Kohlitz from Michigan was the first MCLA player drafted by an MLL team. Connor Martin from Chapman was the first to get meaningful minutes in the MLL. There are a lot of good choices, and plenty of room for argument depending on how you see things. I set out to try and find some way to rank the greatest players in league history. What I’ve come up with is a very imperfect, but hopefully (at least mildly) interesting analysis of the best players in league history based on All-America recognition. I tracked down a list of all All-Americans from 2000-2017. 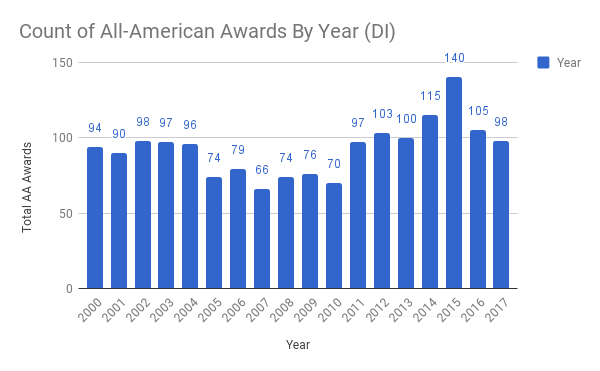 There are a lot of interesting nuggets in that data, like this trend of how many All-America awards have been given out each year. It’s also worth noting that prior to 2006 there was only one division. If you combined both divisions the chart would look more like this. 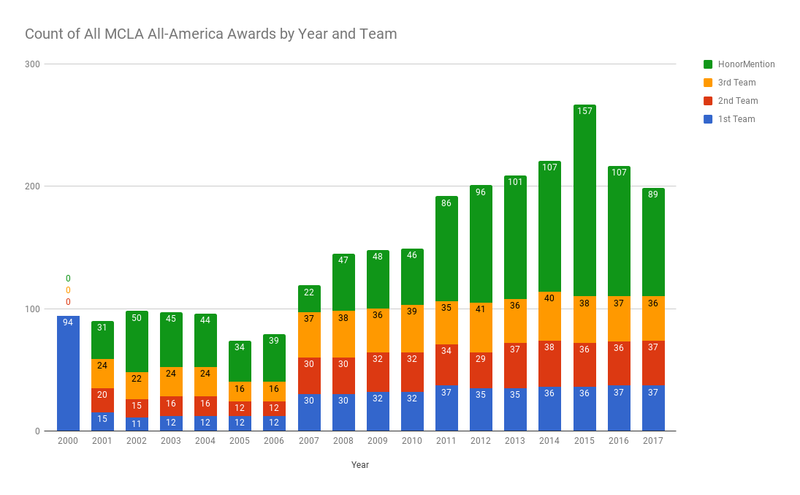 Let’s drill down a little further and look at how many awards were given out for All-America team each year (1st, 2nd, etc). Honorable mention has gotten a little out of hand. 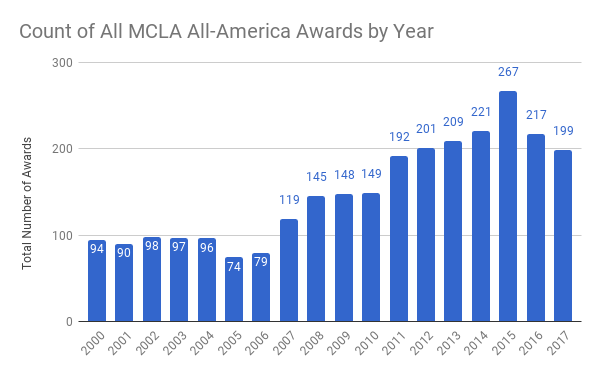 For this post, I’m going to try and rank the best MCLA DI (or A, or just USLIA) players, as decided by the All-America committees, but it’s worth noting that it’s going to skew toward recent players. Simply put, there are more AA awards being handed out. With that established, let’s discuss the simple scoring system. I’d like to tell you it’s super in-depth, but it’s not. So if you were named Second-Team All-America twice (but feel a little snubbed your senior year or something), you would accumulate 6 points. The highest total points possible would be 16 (1st team AA 4x). There are a few ties toward the top, but there is one player that is alone at the very top. With 3 First Team All-America selections and 1 Second Team selection (14 points), Arizona State’s Zack Handy is the most decorated MCLA player in league history. Considering his dominance when he played, this isn’t a huge surprise, but it wasn’t the first name that came to mind when thinking about it. After Handy, the rest of the Top 5 rounds out like this. A pretty solid 5. Certainly encompasses some of the all-time greats, but it’s also leaving out a few of the best. Let’s expand the list a bit. For the starting line-up, I’m going to be looking to fill a minimum of a starting team. Ties only matter by position. For example, there are 7 attackmen because you couldn’t field just 3 without having a tie at 11 points for attack. Basically, I’m refusing to tie break by position. That list looks pretty good! There are a few names left off that should certainly be on a list of all-time greats. Names like Warren Pringle from Sonoma (10 points), Will Patton from UCSB (10 points), Mike Roth from CSU (9 points), Tyler Monteath from BYU (10 points) and more. All that said, it’s overall a pretty good list. It’s also worth noting the Michigan State defenseman Patrick Donovan is a senior this year. With 11 points currently, a First Team selection this year would tie him with Handy for highest point total in MCLA history. Something to watch this season. If you’d like to view the complete rankings of all players, you can find that here. If you strongly disagree with my conclusions, take it up with the data. If the data is unavailable, take it up with me on twitter @JHLacrosse. 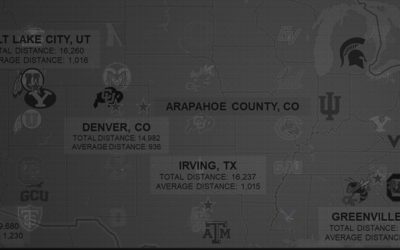 At some point, I will do a breakdown of AAs by team and position to find out which schools are producing the most and at what position. 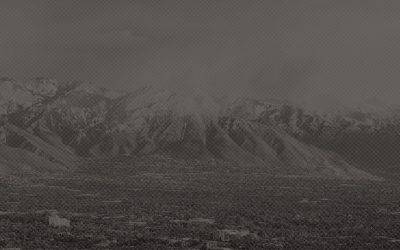 (Spoiler Alert: BYU has the most). Until then, enjoy the start of the season. I’ll be ranting right here all season. If you want to discuss this post more, head to Twitter! The engagement and discussion will be much more lively there than here. Not sure who to tweet at? Start with me!